Tag line: "A ghastly tale drenched with gouts of blood spurting from the writhing victims of a madman's lust!" 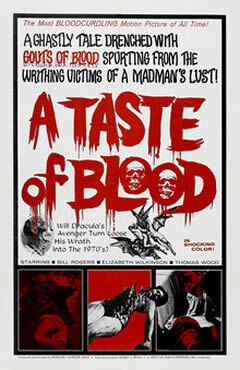 Trivia: "A Taste of Blood" was well-made enough to impress Roger Corman. who offered the director a directing gig, which Lewis politely turned down. A Taste of Blood is a vampire movie directed by Herschell Gordon Lewis, a filmmaker whose works I've enjoyed in the past, and I have to say the very thought of “The Godfather of Gore” taking on the vampire genre was one that had me giddy with delight. Unfortunately, A Taste of Blood proved a major disappointment, and I even experienced a feeling I've never felt before while watching a Herschell Gordon Lewis film: I was actually kinda bored. A mysterious package from London arrives at the office of John Stone (Bill Rogers), inside which are two bottles of brandy and a note, explaining that Stone has inherited the estate of a long-forgotten relative. But (as I'm sure you know) there's more than brandy in these bottles; in fact, they also contain the blood of Count Dracula, who, it turns out, is Stone's ancestor. Not realizing the true nature of this gift, Stone drinks from the bottles and slowly turns into a vampire himself. Once he's a full-fledged member of the undead, Stone travels to London, where he seeks revenge on the descendants of those who killed Count Dracula over a hundred years earlier. Back home, Stone's wife, Helene (Elizabeth Wilkinson), and best friend, Hank (William Kerwin), worry about the recent changes in Stone's personality, yet neither realize just how dangerous he's become until it's much too late. In a number of interviews, director Lewis has stated that A Taste of Blood had the highest production value of any film he'd made up to that point, and just by watching it, you can tell this is true. For starters, in past films, such as Blood Feast and Two Thousand Maniacs, Lewis regular William Kerwin was usually the best actor of the bunch, and while he does continue his streak of dependability in A Taste of Blood, he's matched this time around by Bill Rogers, who brings the right balance of likability and menace to the part of Stone. Even the story itself, about a man taking revenge for perceived wrongs done to his ancestor, is an enticing one. Unfortunately, it never fully panned out, and I think a big reason why was the “artistic clash” between Lewis' style of filmmaking and the material itself. While the great director's standard doses of constricted sets, jumpy edits and one-camera set-ups worked marvelously in a 67-minute gorefest like Blood Feast, they lacked the power to pull off a nearly 2-hour vampire story, especially one that favored character development over spectacle. Ultimately, it was a lack of visual variety that did A Taste of Blood in for me. I take no great pleasure in making the above statement; Lewis' trademark style is the key reason I fell in love with movies like Blood Feast and The Wizard of Gore in the first place. But in this film, telling this rather complex tale, Herschell Gordon Lewis himself was undoubtedly the weakest link. Benny: Thanks so much for the comment, and for your kind words about Horror Jungle. We appreciate it! We're glad you found the show so enjoyable, and thanks for listening! The support that both of you, and all the other HJ fans, has been overwhelming, to say the least. Thanks for stopping by. And rest assured that all of the hosts will be back, in one capacity or another, somewhere down the line. Thanks so much, and all the best to you! @Sonny: Thanks for stopping by! Glad you enjoyed the show, and please be sure to stop back and let us know what you think of the recommendations when you see them. Thanks for listening, and all the best!